When I was in the fourth grade I joined the boys' choir at Our Lady of Pity (Notre Dame de Pitié) church in North Cambridge, MA. We were called Les Petit Chanteurs de Notre Dame and sang both in church and outside of it. I was a soprano then and learned to sing well enough, but teaching musical at a theoretical level wasn't part of the program. Later, in high school, I joined the band, having failed to make the baseball team as catcher, nor anything else. They at first gave me a baritone horn as my instrument and then a clarinet, but my lack of a musical background and an inability to read music led to me being reassigned to carry the front end of the bass drum in parades and at football games while the others played. Yet I soldiered on, and after settling down in family life and the world of work, I tried to learn keyboards, drums, violin, guitar, harmonica, and tin whistle and came up with the same result. So I decided to become a musical audience and to try to understand music from the listener's side, and to learn more about the structure and form and function of music that way. I remember listening to the radio as a vary young child in my grandmother's kitchen as her aunt worked there doing laundry, cooking and such while Memére worked outside the home. This was the 1940's so the songs played on the radio were of that era and so were the singers. To this day I remember the lyrics of many of those tunes and can sing along when I hear them played. By this time you might be thinking, "What has any of this to do with Key West?" 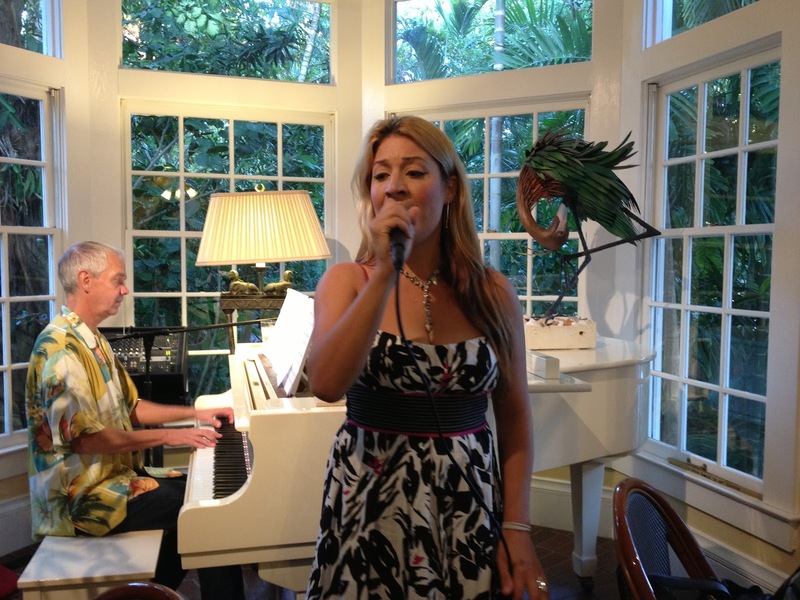 Key West is a great place to listen to music. Live music, the kind that really matters (IMHO). 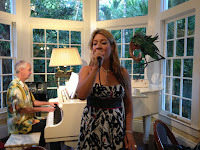 Last night we went to a birthday party for a local musician, Jimmy Olson, at his home. Jimmy is a pianist of some accomplishment and performs locally, playing and singing the standards of a different era than this one. He appears to know a very large catalog of music by heart, and can play and sing almost anything, given sheet music. Fortunately there are venues where performers like Jimmy can perform for appreciative audiences. He also has a wide circle of friends who are similarly talented and gives them the opportunity to sing along with him, or to take over his seat at the piano and perform on their own. We enjoyed such a performance last Saturday at the Gardens Hotel and it turned out to be thoroughly enjoyable. A visitor from Cleveland, Joseph Iacobucci, sat down and regaled the small crowd with songs he wrote about Cleveland, Los Angeles and Washington, DC. He made me think of, and I told him so, the Capitol Steps. Jimmy is also mentoring a friend of ours, Gianna Skyy, as she begins to develop a following among the musical cognoscenti. Gianna had three performances last week, first at a fundraising event on Friday at Cowboy Bill's, on Saturday at the Gardens Hotel, and then with Jimmy last night at his birthday party. She has a strong voice and can belt out a song, and now she's building up her songbook with covers of Adele and others, and some of her original songs. She's definitely a budding talent. We still love places like The Green Parrot, Smokin' Tuna, et al. Yesterday we even travelled to Boondocks on Ramrod Key (MM 27.5) to hear Bill Blue and the Nervous Guys perform at a benefit for Habitat for Humanity of Key West and the Lower Keys. Bill Blue is kind of the house band for Marlin docks and the rest of Houseboat Row, one of our own, and a venerable blues man since back the 1960's. All in all, the incredible music talent here blesses me, fascinates me, teaches me, and sustains my life-long interest in music as an art form. Maybe I'll join a Kazoo band. I think I could handle that. Or I could just whistle a happy tune. I've always had a knack for quickly memorizing song lyrics, as well as the pacing, to the point that people frequently comment on it. Now I know from where that talent likely comes. Too bad I can't carry a tune to save my life.